If you’ve looking for low fat pork chop recipes, I’ve got this ‘skinny girl’ series of recipes going. And, by skinny girl, I really mean healthy girl. Or boys, guys, men. Not singling y’all out by any means! 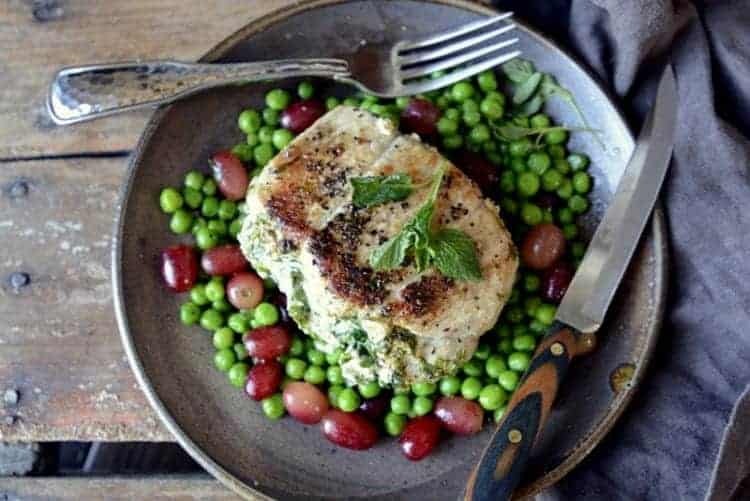 These skinny girl stuffed pork chops are just so simple to make. Quite different in flavor. They are shockingly easy and impressive to serve. They’re low carb. Low glycemic. All those good things that make you feel good about eating! I’m also using pork because one of my devoted followers on Facebook Ally’s Kitchen Bohemian Bold page keeps leaving me comments on chicken posts. Seems I share a lot of chicken from my recipes and from other foodies’ recipes. That’s pretty natural for me since I love chicken and am always looking for new ways to prepare. Plus, chicken is one of America’s favorite meats. Annnneeehooo, this particular person lets me know in all caps with her comments, “NO MORE CHICKEN”!! Another amazing thing about these chops? Well, after I made them, they weren’t eaten. So, of course, I wrapped and refrigerated them. The next day, my hub, Ben, warmed one in the microwave and had for lunch. He said it was superb! Then there was one left that we had the next day for breakfast. Here’s what I did. Heated a cast iron skillet really hot. Coated with some cooking spray. Then put the chop in, turned the heat to medium low, covered and let it steam for about 10 minutes flipping it once. Then I cut it into about six lengthwise slices, served three to our plates and topped with a steamed sunnyside egg. Girrrrrrrrrrrrllll, talk about good! Just decadent for breakfast! There’s nothing complicated about this low fat pork chop recipes. It’s truly very simple to pull together. The most technical aspect of it is creating the pocket opening in the pork chop to add the stuffing. That’s why you want nice thick boneless chops. They hold up to the technique best. And, if you’ve never used cooking twine, then get some next time you’re at the store and keep it on hand because you’ll see we’ll be using it in other recipes! Combine in a small bowl one half teaspoon of salt, pepper and the jalapeno seasoning blend. Mix together and blend. Set aside. In another bowl, combine four tablespoons of olive oil, fresh chopped greens, goat cheese and the blended spice mixture. Blend into a thick ‘paste’ like mixture. Set aside. Take the pork chops and using a sharp knife make a slit from about end to end on the center part side of the chop. Slice into the chop making and ,make a ‘pocket’ opening. 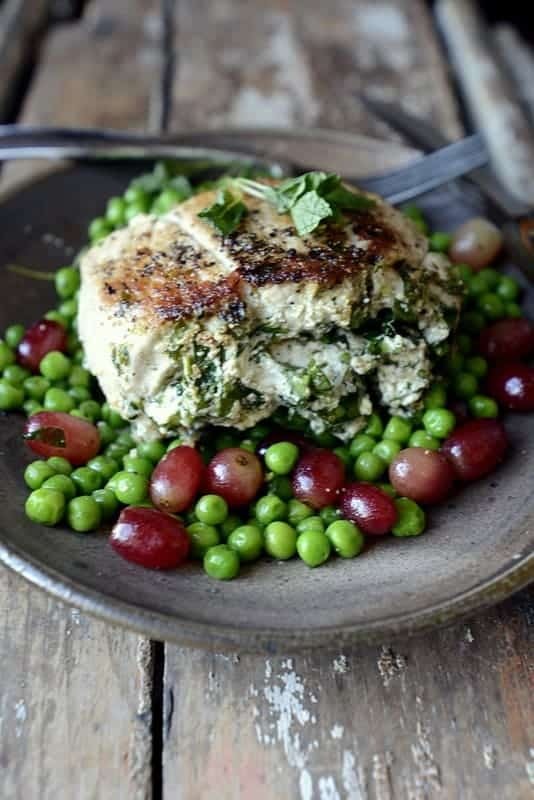 Stuff the pork chops with the greens/goat cheese mixture. Be sure to push most of the mixture down into the cavity and pack in. Take a 10-12” piece of cooking twine. Wrap around the middle most part of the chop. Tie into a knot. Sprinkle both sides of the chops with the remaining salt and pepper. Heat a large cast iron skillet (10”+) over medium high heat. When hot add the remaining olive oil. Place the chops in the hot oil. Sear on the first side about 2 minutes. Carefully turn (using two spatula flippers to turn) and sear on the other side 2 minutes. Reduce heat to medium. Cover with a large lid. Cook another about eight to ten minutes turning once (internal temperature 155-160). If some of the stuffing begins oozing out, just gently push it back into the chop (as best you can!) with a spatula. Remove to a plate. Take clean kitchen shears and snip the cooking twine and remove. Serve immediately. 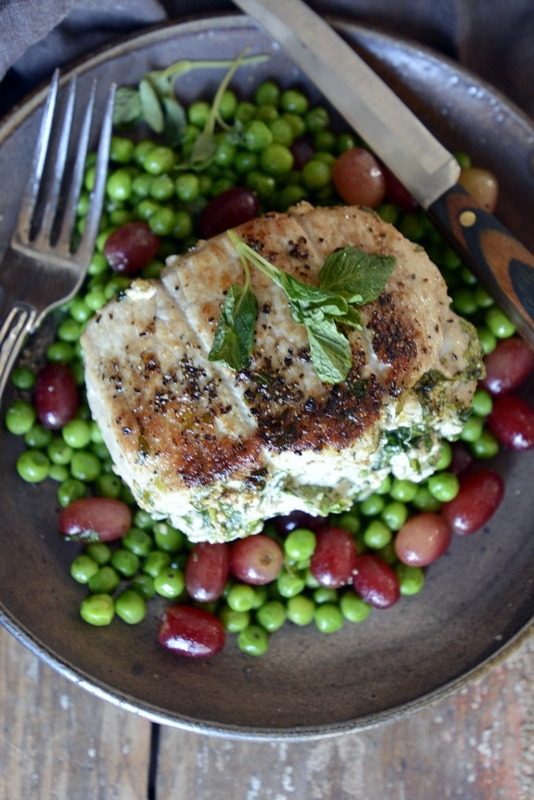 I served with steamed peas, fresh mint and red seedless grapes. These pork chops refrigerate well for a day or two. To reheat, put in a cast iron skillet. Coat with cooking spray. Turn heat to medium low. Cover with a lid. Just let the chop heat, turning once or twice, for about 8-10 minutes. These were absolutely delicious. i substituted feta for t he goat cheese and i had fresh spinach instead of arugula. Will definately make again Thank you! 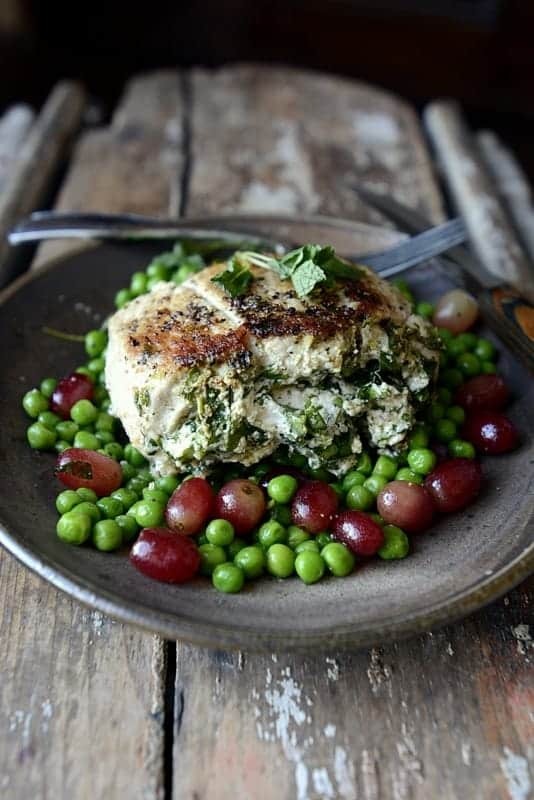 Your mousse is good, but stuffed pork chops are better!! I’ll be adding this to the menu this week, Ally! Hope you’re staying warm, luv. These look so good. fabulous photos!!! I can’t believe they’re skinny! That goat cheese filling sounds AMAZING. I just LOVE a good chop, and the stuffing in these knocks them right out of the deeeee-licious park!!! Scooch those babies together! I love your videos! Awesome recipe Ally Girl! Why thank you, luv! Yes, the stuffing just makes these chops CHOP!!!! Will have to save this delectable recipe, really sounds so good! Ally, do you think it is doable with beef or lamb? I don’t eat pork, but I so loved the technique, and the creativity in making a pocket and stuffing the meat with goat cheese, arugula and jalapeno! Just divine! Xo xo! Love goat cheese!! These look incredible — and they are SKINNY!! Thank you for the great recipes!! tweeted and sharing to pinterest! looks fabulous as always loved stuffed anything pork is awesome!